It’s been awhile! We have some good news and we have some bad news. The bad news: as the title indicates, this will be our final campaign. The good news: it’s a big one! This project has been such a joy for us over the past 3 years. We’ve raised tens of thousands of dollars and hopefully raised some awareness, too. But as we focus our energy helping kitty cats in other ways, we are going to make this our last official Teal Cat Project campaign. But we do have future plans, so check in with us from time to time: we’re not done yet! OK, now for the cool part! Like we said, this campaign is going to be big! We have a LOT of teal cats that need loving new homes. And so we are splitting up the proceeds between four charities that we LOVE. First up: From Chico Country in SoCal, Neighborhood Cat Advocates. Next! A little local love to the The Cat House in Lincoln, Nebraska. And finally, the most adorablest name, Meow Village in Aurora, Oregon. We are so happy to be able to donate to these amazing and hard-working organizations! This campaign is dedicated to our favorite summertime treat: FRUIT! Kitties are adorned with grapes, apples, watermelon, strawberries or cherries. 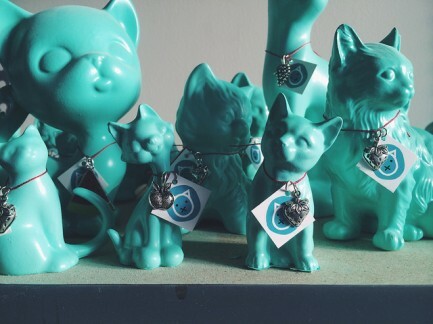 A little incentive for you: the first 50 orders of $50 or more will receive a little Teal Cat Mini. 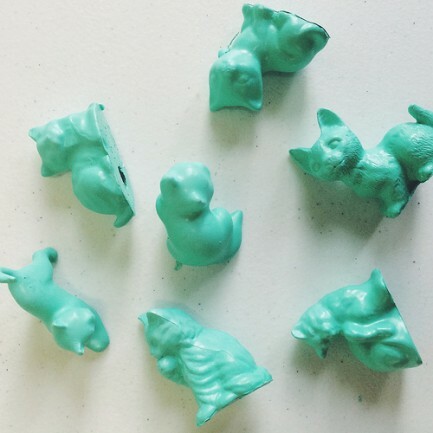 These tiny babies were too small to wear tags, but they’re super cute and will look smashing on your dashboard. Also, we’ve reduced the price on shirts and aprons. All t-shirts are $12-15 and aprons are $15. Make these your summertime tees. And wear your apron to the vegan barbeque, of course. Thank you thank you thank you for filling our hearts with joy (and teal) over the past few years, and helping soooo many kitties all over the country. WE LOVE MEW! Now go get some cats! LOL, Neighborhood Cat Advocates is in Chico, which is in Northern California.